Button N Thread is an Australian (Sydney) based online boutique that sells unique and trendy clothes, bags and accessories for women! They don’t stock many of the same item, so you can be sure that your outfit won’t clash with your friend at a party! They carry top quality, designer inspired fashion that can suit a variety of ages. ♥ And lucky for us, Button N Thread is having an awesome sale at the moment! Special Offer: Button N Thread offers Free Shipping (any garments! ), Guarantee Next Day Delivery and beautiful Gift Wrapping to all Australia customers! Button N Thread carries the latest in celebrity trends at unbeatable prices and suit sizes 6 – 12. We are also offer return and exchange of items and a surprise gift to all customers for their purchase to ensure they receive top service and great shopping experience from us in 24hours a day! The other day, Tammy, the director from Button N Thread asked me to review some of the clothes from this wonderful boutique. And we ended up discussing some possibilities for a future giveaway for you girls ! But before that happens, I’d like to show you some of my picks from the awesome boutique. First of all, these three dresses are absolutely love. I absolutely loveeee headbands. And these two with pearls are absolutely gorgeous and they look quite elegant, no? And the metal butterflies on the belts would work perfect with a lot of my high waisted skirts ! And check out Button N Thead Online Boutique before the sale ends! My name is Bogdan from Romania! I want to make friends! Can we be friends?? LinkExchange?? My favourite item is the Summer Long Maxi Dress – Brown and the Fluffy Sleeve Silk top – white. 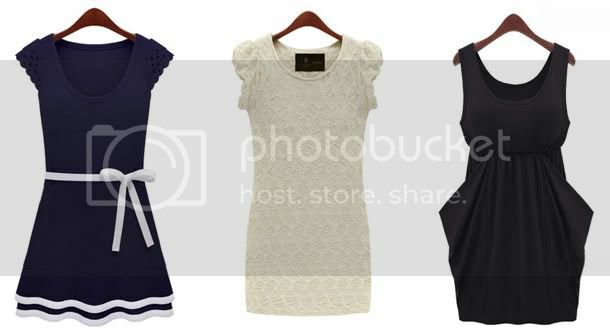 I like the first navy dress and the the pearl white one! May I say you have a great figure. ^_^ Really love the one you're wearing there. why they don't have it here! And the jewels and etcetera O_O also so pretty! oeh, everything are looking super cutee =D love the dressesss!! Thanks for this site! I love online shopping =w= it's a (bad) habit…. Also like the idea about the limited stocking, I don't want people pointing at me like "oooh she's wearing that dress from that shoppppp"
Anyway time to check the site out! must say i love the barbie dress too, slightly vintage-y? The three dresses look adorable! My fav must be the barbie dress! I love the nautical feel! aww thanks for the comment on my nails! I feel they are a bit too much for me hahaha I hope no one ruins my photos next time I try to take one!!! One time I had a scary old asian man screaming in the back of one of my photos, total ruin! Especially when I thought that it was an actually decent picture of me, but then the old man ruined it!!! Ahhh photoshop….true but then again so much time needed, next time I'll just scream at the kid LOL!!!! Button and Thread is a cute store hehe. Like the first dress!!! :D And I wish we had more cute shops here in my city .////. today i wrote the letter to you!! I love the pocket dress! Ohhh you should arrange another meet up. I would love to finally meet you ;] haha keep me posted k babe ?